The Guild label based both in Switzerland and in Britain is to be congratulated on the fascinating, little-known and unfashionable aspects of the repertoire which they regularly uncover. Recently I have been asked to review their discs of Albanian Piano Music, Haydn played on the Clavichord and Choral Music by Paul Engel, Knut Nystedt and others. A few years ago they brought out a disc of music by Robin Orr. They offer so much of unusual interest, and now they tackle a Swiss composer who, I am ashamed to say, was a completely new name to me. 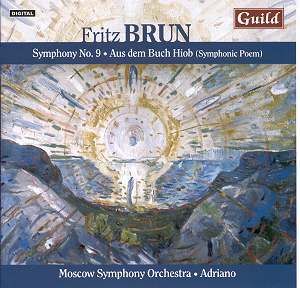 Quite apart from many chamber works Fritz Brun also produced ten symphonies. The conductor, Adriano as he simply styles himself, looking rather like a deranged magician in the picture on the back of the booklet, writes extensively and fascinatingly. From him we read in the excellent accompanying booklet from which I will quote, about Brun the man and the musician, and about the two works recorded here for the first time. Let�s begin with the Symphony. Movement 1 is simply entitled �Vorspiel� an introduction to the work as a whole which includes themes to be developed later as indeed to a certain extent does the Second movement. This introduction is a somewhat jocular happy movement of six minutes duration. Adriano writes about the music and place where Brun was living at this time. "The sculptor Hermann Hubacher once wrote to Brun �When I listen to your music � I feel transposed to a blossoming alpine meadow in between rumbling pieces of rock and mountain streams�. After his retirement from conducting Brun went to live in Southern Switzerland near the mountains and the Lake of Lugano and has apparently been dubbed the �Swiss Sibelius�." Right from its opening the mood of happy tranquillity is set. Movement 2 is an eight minute �Serenade�. The composer supplied a programme note for the original Bern performance in December 1950 and he says of this movement that it "belongs with the Love scene", that is the following movement It has what he called "conversation pieces". You could be forgiven for almost hearing Mahler in this music - a large orchestra used in a chamber music fashion. This brings us onto the question of who else can be heard in Brun�s work. Of course he has his own unique voice, and listeners need to concentrate and to have patience to enable them to follow the argument and form. However if it is of any help, and this movement prompted my thinking in this direction, then perhaps Hans Pfitzner (1869-1949) and sometimes Franz Schmidt (1874-1939) lie near at hand. Adriano suggests Richard Strauss�s �Symphonia Domestica�. Movement 3 �Liebesruf� - translated I feel as �The call of Love� - is a little longer, possibly rather over-long for its material. Again it has an extensive programme note, quoted in full, beginning "A group of young people play music in the nocturnal silence of a park in front of the balcony of a house". This leads to a courtship scene of great �Korngoldian� charm. Movement 4 marked Allegro is �Im Kreis der Freunde�. The booklet offers no translation but I plump for �In the circle of friends�. Adriano tells us that the composer was "said to be a very earnest and rather gruff character; his vehement outbursts of temper could suddenly give way to a benevolent, serene smile. This is just what we hear in the music." This movement, a somewhat comic, scherzo-like affair has these characteristics. There is a quote from Flotow�s opera �Martha� which one of the friends suddenly sings during a somewhat heated conversation. The most substantial movement is the fifth which is the last. Its title is best translated as �Belief and doubt/Praise of God and nature�. To quote the notes again "This extended movement itself is a passionate symphonic poem about belief, hope and love of life". These are huge Brucknerian problems, found in his Ninth Symphony, an ideal thing for an elderly composer to be tackling. This movement can surely sum up the entire symphony in its scope and emotional journey. It is worth hearing on its own in many ways. The other work is on track 6 of this generously filled disc. It dates from 1906 and is a symphonic poem "Aus dem Buch Hiob", �From the book of Job� as found in the Old Testament. Having lived with this disc for upwards of three months I have to say that this piece has yet to make much of an impression on me except that it is solemn and sometimes a little pompous. I fail to warm towards it. The accompanying photo of the composer in the booklet makes him appear happy and easy-going, perhaps in his early twenties. He was however 30 when this work easy written and in it he was earnest and severe. An earlier reviewer apparently described it as "a deep work "and later as full "of sinner�s sufferings"; that is the mood of this piece. However its climaxes seem un-dramatic and uninteresting. I fail to see how the story of Job is truly reflected in the music. What I can say for certain is that both of these very rare works are presented superbly both by the orchestra and by the recording engineers. I suspect that Adriano is the driving force behind the disc and its final presentment, notes on him and on the Moscow Symphony Orchestra are given in the back of the booklet. Reading his notes it is obvious that he is not only an enthusiast for it but that he also knows well the other symphonies. I presume that he may well want to record all of them as he has already had the Third issued on Sterling. If that is the case then, despite various reservations I would certainly sign up for some further instalments. It�s true that this is, despite its familiar late-romantic language, tough and knotty music but it is, certainly with the symphony, well worth attempting to understand. Knowledge of the earlier works or indeed of the final 10th Symphony would serve to cast further light on a little known figure in 20th Century Swiss music.